An afternoon of organised chaos is the best way to describe the flurry of hands, chatter & smiles as the donated clothing was brought out for the community to share around. It’s been an enlightening time for us, not only have we discovered in a community living on a dump there is still the ‘have’ and ‘have not’ element, the community decided that it didn’t want to just ‘accept’ the donated clothing, they wanted the opportunity to pay something (for those that could afford it) with the money raised going directly to providing food for the kids. We were blown away, the community was working together to ensure that those people who could afford to pay; paid something, but those that weren’t in a position to do so were still taken care of. And it didn’t take long– the 80kgs of clothing vanished in the blink of an eye! This community doesn’t want charity forever, they want to ultimately be able to support and create a future for themselves and their families. As in our earlier upload, this community is changing so much, there is still so much to do and such a long way to go, but the efforts of Fred and the ETB team are starting to pay off – the programs are starting to achieve results and it’s becoming more self sustainable – which is the ultimate goal! Friday started off busy – and with the heat kicking in, intense traffic on the roads due to Songkran starting soon & so much to do, we knew it was going to be a long day… Between clinic runs and shopping for the community, we caught up with the family of 7 that moved from the dump a couple of years ago & they’re doing so well! Even in the Mae Sot heat the kids were running around & excited to see Fred – maybe it was just because he was bearing icecreams….ha ha ha… The eldest daughter is learning English & her language skills have come such a long way since last year – she’s growing up so fast!! We really love catching up with them & they are at the very heart of why we keep doing what we can to assist. 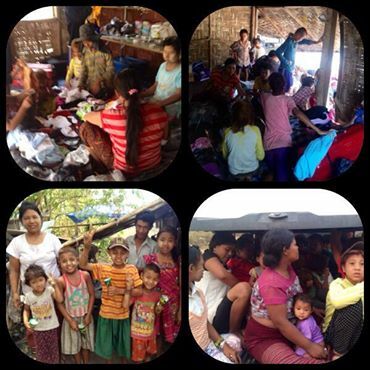 The support Eyes to Burma provides gives those families who wish to be independent the confidence to take control of their own destiny, but with help if and when they need it. Friday night saw us at the Burmese night market with a few of the adults and a number of the children. Night market is huge in the Burmese community – the sights, the sounds – it’s a remarkable place and the ‘farang’ definitely stood out. Given it was close to Songkran, we decided to treat the kids and provide them with some money to purchase something for themselves. These kids never cease to amaze us, the majority, rather than buy something for themselves, purchased food and clothing for their families. Family is important to these kids. Not all of them have strong family support on the dump, but even so, they would still prefer to spend money purchasing extra food for the family rather than spend money on themselves. Just amazing to see. The kids make us smile all the time. They’re always wary of newcomers at first, but once they get to know you, they just love spending time with you. Being able to have a conversation with them also makes it so much more fun – we were teaching them words in English and they were teaching us words in Burmese – we know who was better at that don’t we – I think we now know two Burmese words that we can actually remember!! Another thing we found so heartwarming is that there are some young orphaned kids living on the dump site that have been taken in by other families. Bear in mind, it’s hard enough to make ends meet with your own kids, but these families are prepared to take in other children to ensure that they are fed, clothed, educated and have a roof over their heads. It’s the generous nature of the people within this community that makes it all worthwhile. Again, there’s still a way to go, but it’s heartening to see that progress is being made. With the assistance of Fred and ETB, this community is starting to make inroads, take responsibility, be educated and assimilate into the broader Mae Sot community. It truly is an exciting time. That’s it for today, will update again soon!